One summer, two decades ago, the sheriff of Polk County spent a considerable amount of time mowing a lawn. And it wasn’t his lawn either. It was the lawn of a widow whose husband died in the line of duty. 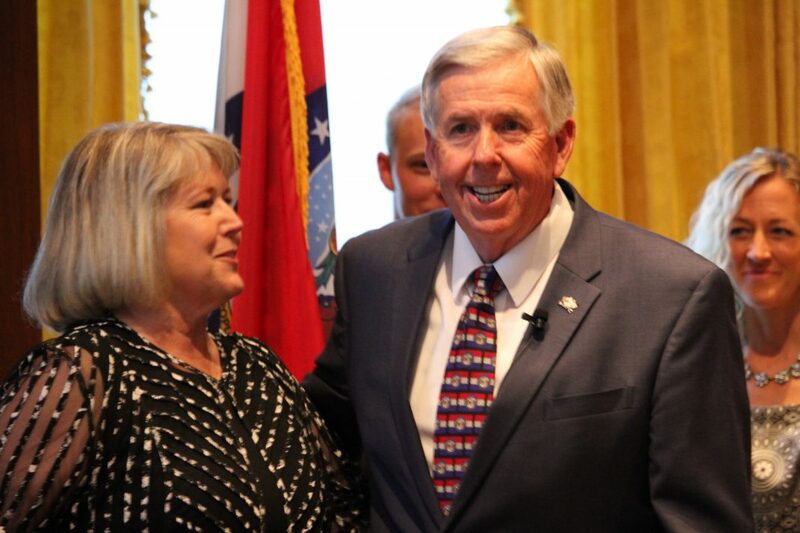 Fast forward to 2018, that sheriff, Mike Parson, is the Governor of Missouri and Rachel Lightfoot has been the treasurer for his campaign since Parson first decided transition from enforcing laws to making them. In October 1997, Lightfoot was 19-years-old, working at the local bank, had been married for more than a year, and, unbeknownst to her, pregnant. Her husband, Brad Mabee, worked as a law enforcement officer under then-Sheriff Parson. While Mabee was on duty one night, he got into a single-vehicle car accident. The exact circumstances of the wreck are unknown though “based on the speed and the lights he was going after someone.” He did not survive the accident. That night, Lightfoot was awoken at roughly 11:30 by Parson’s wife, Teresa, and one of the under-sheriffs. “They took me to the sheriff’s office and we waited for Mike, who was out on scene at the time. Once he got back, I hopped in the car with him and Teresa and we flew to Springfield, to the emergency room,” Lightfoot recalled. The Parsons went above and beyond after Mabee’s death. After the death of her husband, Lightfoot started showing signs she was pregnant but chalked them up to the stress. It was after a coworker at the bank convinced Lightfoot to take a test did she discover she was pregnant. It turns out that at the time off the accident, she was two weeks along. While she didn’t tell Parson or her husband’s co-workers, she knew after announcing it at the bank — where Teresa also worked — word would get around. “News like that in a small town, after a tragedy, it doesn’t take long to spread,” said Lightfoot. As her pregnancy progressed through the spring and summer of 1998, the Parsons came and helped Lightfoot in what ways they could. And later after her daughter was born, “Mike and Teresa were always more than eager to babysit” and have maintained an interest in her life. “They have always gone above and beyond,” said Lightfoot. And when Parson decided to run for the Missouri House in 2004, Lightfoot was there to join the campaign. She signed on as treasurer for the campaign, a role she maintains to the day. Lightfoot said that the Parson’s never made her feel like she owed them anything and that she joined the campaign because she believed in the cause. Though if they were trading lawn mowing for campaign work, Lightfoot joked, she may have done more campaigning.